Now, let’s be honest. I’ve never been one for organisation. Most of my efforts are one directional – energy in bounds for the creativity/messing things up bit, not that much left for the whole putting away process. But as the years have passed, I’ve come to understand that if you want to be productive and actually get sh*t done, you need to make life as simple as possible. Which is where I’ve started, slowly, to embrace little organisational hacks in my life – design features that make me want to put stuff away after I’ve used them. Which is what this pantry update is. Not exactly reinventing the wheel guys I know, but it has felt like it for me. Even the act of sitting on the couch and popping out those little labels in my grade four-esque label maker has a therapeutic effect… Perhaps this is the dawn of a new era for me? One with labels and ‘things that have their place’?. One can only hope. On the subject of growing up and getting serious (or boring – depending on your outlook), I recently made the mistake of downloading the iHerb app onto my phone. If you’re not familiar it’s basically a huge online health store, based out of the US but they ship most places and their products are pretty damn cheap, at least way cheaper than this side of the pond. Thanks to being able to buy from iHerb at the same time as watching Netflix I’ve been consistently stocking my pantry with a range of different healthy essentials. In all seriousness it has made eating healthier at home way easier. Mainly thanks to those little black labels?! These are the things I’ve bought that I use all the time. 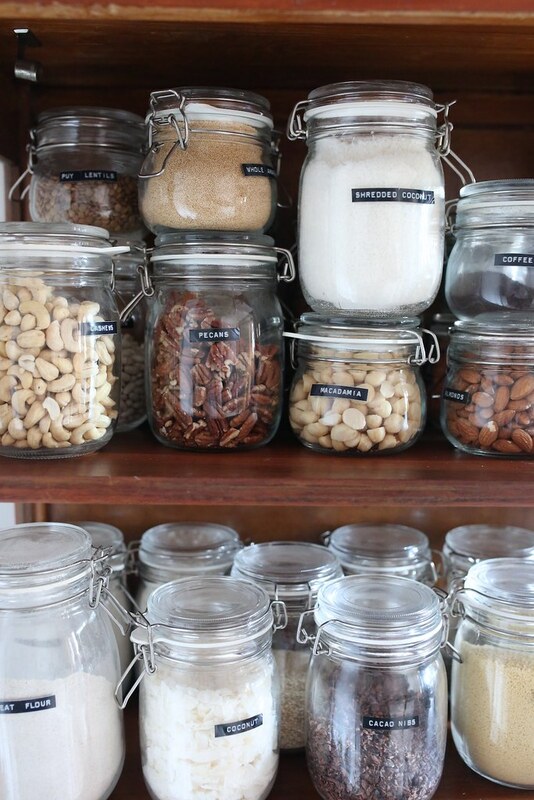 Nuts: almonds, cashews, macadamia, pecans, pine nuts. For nibbling, putting in smoothies, making healthy balls out of, toasting and putting on salads. Coconut flour. Mainly for making pancakes and banana muffins. Desiccated coconut. For making healthy balls out of and adding to smoothies and cakes. Flaked coconut. For putting in smoothies and adding by the handful to steel cut oat porridge. Buckwheat Flour. For making pancakes out of (recurring theme). Almond flour. For making banana bread out of. Steelcut oats. For making porridge out of (a big batch made on sunday is a quick fix for the week). Wayyyy better than quick cook oats. Psyllium husks. For adding to smoothies. Lentils – puy, red and green. For having with fish at dinner. Or for making dhal out of. Hemp seeds. For putting in smoothies. Pumpkin seeds. For toasting lightly and having with blueberries and greek yogurt. Quinoa. For making into a side salad dish or a coconut pudding. Brown rice. For making spiced pilaff with. Raw cacao powder. For making raw chocolate balls out of. Mung beans. For soaking and then putting in a mason jar upside down so they sprout and then sprinkling on breakfast etc. This sounds so hippy, and indeed I did pick it up off my mum, but its really good. 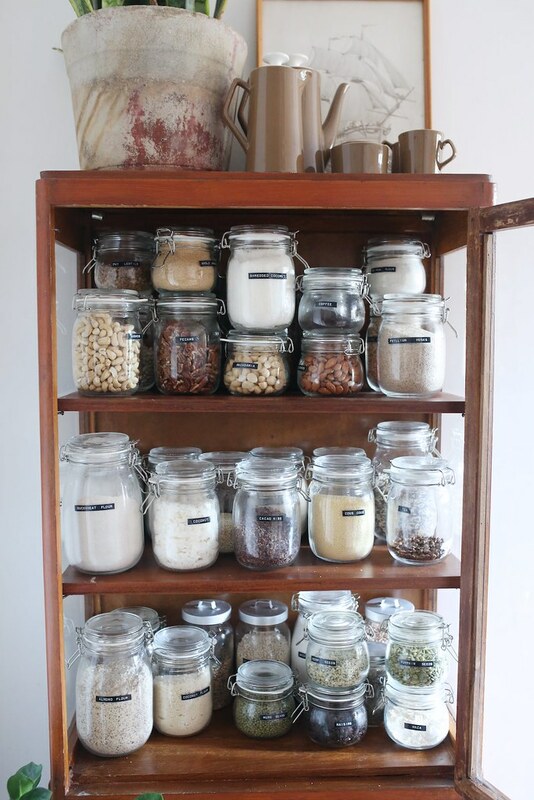 This was just a bunch of jars from ikea and an old school label maker. It’s pretty simple really, just make sure you use some hot water/alcohol where you apply your jars so there’s no oil which makes the labels peel off.